American history has always promoted the myth of the original thirteen colonies. In truth, at the time of the American Revolution, there was no such thing as thirteen colonies. There were actually nineteen – six of those colonies did not agree with the Revolution. Those colonies became Canada. Page 13. WHEN something comes up missing or misplaced, occasionally it’s not a bad idea to look for it in your neighbour’s basement. In the case of the missing history of Black hockey players, Canada’s basement is the most logical place to look. Hockey, arguably the fastest and most exciting team sport to watch, has traditionally been considered a white man’s game. And why wouldn’t it? 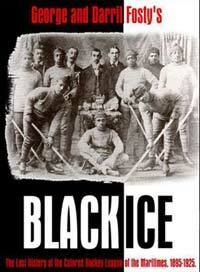 Hockey, adapted from a game played by the Mi’kmaq Indians, originated in Nova Scotia, Canada, a country even today with just a two per cent Black population. And that’s up from one tenth of one per cent just 30 years ago.